A nationwide mass sampling tour in the UK’s largest train stations, giving commuters an easy dinner to throw in the oven when they get home! A nationwide roadshow was implemented on behalf of Dr. Oetker. 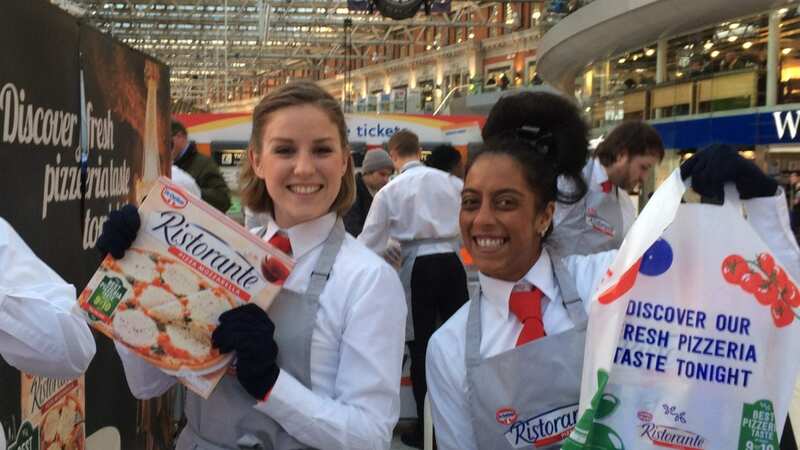 Full-sized frozen Ristorante pizzas were sampled, and discount vouchers were offered in various UK public transport stations. Commuters were provided with a simple, fresh and delicious dinner solution. At the same time, through a social media competition, they could enter to win a trip to Venice, Italy. Elevate managed all elements of bringing this campaign to life – journey planning, site space sourcing & booking, production, logistics, reporting and staffing. Our staffing team was build up of a core team of an Event Manager, Assistant and logistics manager, who guaranteed consistency and efficiency in each market, where our local teams of Brand Ambassadors supported them. As well as an efficient staffing team, we worked closely with our partner agency to ensure that the activation was rolled out optimally across all elements to ensure all KPIs and targets were met. Working in true partnership with our agency client enabled us to collaboratively deliver an outstanding campaign for the end brand, which surpassed all targets and expectations.